Optimising for the Long Tail of Search? Don't, It's a Waste of Time! Optimising for the Long Tail of Search? Don’t, It’s a Waste of Time! If I read one more dumb article about optimising for the long tail of search I’ll scream! You don’t optimise for long tail keywords, you write content and if your web designer or SEO consultant is telling you otherwise it’s time to change to a new one. That’s it, there’s no more to it, just write great content and lots of it. Confused? Read on and it will all start to make sense. Now this is a long tail search because it’s long right? Wrong! 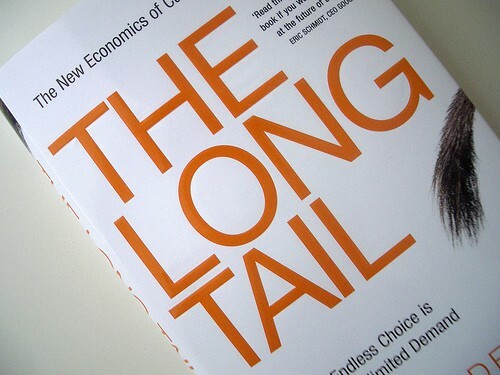 It’s long tail because it’s hardly ever used not because it’s got a lot of words in it. You can have long tail phrases with lots of words in them and you can have really short long tail phrases. The bottom line is, it’s the frequency with which they are used, not their length. Now, some confused web specialists believe optimising pages for long tail search is worth while and the theory goes something like this. Everyone is chasing the keywords at the head of the search curve. Let’s use a simple example to explain and assume lots of people search for widgets, but lots of pages rank for this search and they’re strong pages. The long tail brigade might argue that ranking for something like orange chocolate coated widgets is something you should consider instead. They would suggest you create a page, optimise it for this phrase and by doing this you’ll secure the number one ranking when the 1 person who ever searched for this does their search. Nice work! Long tail search traffic could make up a large percentage of your website visitors but the only way to do it sensibly is to write lots of killer content, that way you’ll include lots of long tail search phrases on your site by default, not by optimising for specific long tail phrases.